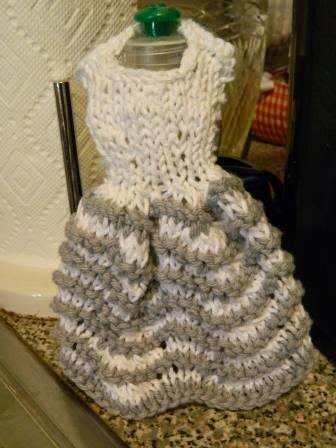 The original dress style dishcloth is now called Going Dancing. I continue to knit these and have made quite a few of this style through the years. The pattern is now in the Knit a Dress Dishcloth Book by Leisure Arts but I knit the very first one in 1998. I’ve always loved the feather and fan stitch. After knitting a baby blanket using feather and fan, I couldn’t shake the idea that it looked like a skirt. I began experimenting with worsted weight cotton yarn and before I knew it, I had decreased my way to a waist. Figuring out the bodice took a little longer and finally the shoulders, neckline and of course, the hanger. I’ve designed many other dress style dishcloths since this first one using a variety of stitch patterns for the skirts but I always come back to this original style. 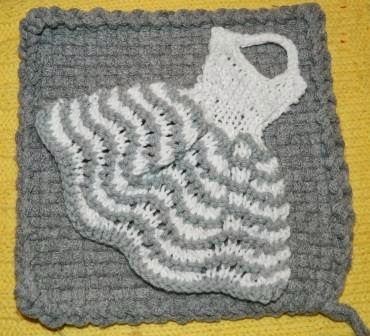 Since my latest color infatuation is gray, I decided to knit the dress dishcloth in gray and white. Added to the new potholders that I made, it’s a great hostess gift for the upcoming holiday season. And to make it extra special, I’ll be looking at the kitchen items on Mod Cloth. They have a unique variety of items. (Mod Cloth items are affiliate links).